The American Architectural Manufacturers Association (AAMA) is a recognized leader in the fenestration industry through product certifications and standards development. A series of AAMA tests have been conducted using organic coatings on aluminum extrusions and panels, resulting in 3 standards by which coatings can be attributed: AAMA 2603, AAMA 2604 or AAMA 2605. FEVE resins have been proven to exceed AAMA 2605 standards, which are an excellent choice for coatings for projects that demand high performance materials. The AAMA tests are conducted at Q-Lab in South Florida, which is considered to provide excellent data due to its subtropical climate, producing more moisture and sunshine in one year than most states equate over several years. In order to test coating materials to determine their AAMA rating, coatings are applied onto aluminum panels and are subjected to direct sunlight exposure tests, as well as accelerated salt spray corrosion. The highest AAMA rating, AAMA 2605, requires coatings to withstand a ten year exposure test. Coatings that meet this standard are extremely weather resistant, abrasion and erosion resistant, and have high gloss and color retention. 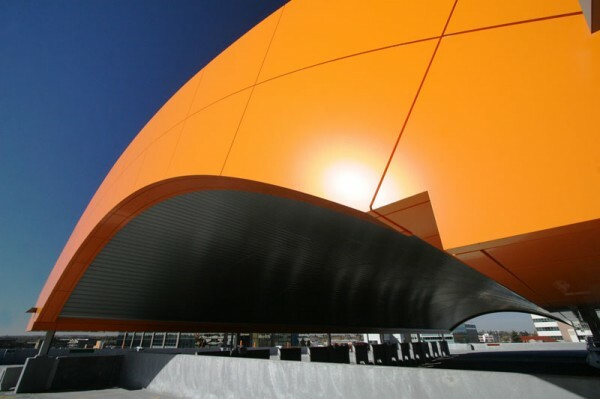 Lumiflon FEVE resins have been tested and proven to retain these same properties in excess of 30 years from early applications of FEVE-enriched coatings on various coastal projects. One Response to "FEVE Resins Among the Top Coatings in AAMA Exposure Tests"
Do you have a Distributor for your products in India?